WHAT? CFPB Director Cordray says that consent orders that accompany the Bureau's public enforcement actions, "provide detailed guidance for compliance officers across the marketplace about how they should regard similar practices at their own institutions. If the same problems exist in their day-to-day operations, they should look closely at their processes and clean up whatever is not being handled appropriately." He added that "it would be 'compliance malpractice' for executives not to take careful bearings from the contents of these orders about how to comply with the law and treat consumers fairly." The steps needed to avoid similar problems. Participants receive a detailed manual that can serve as a resource. 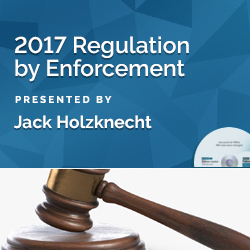 About the Speakers: Jack Holzknecht is the CEO of Compliance Resource, LLC. He has been delivering the word on lending compliance for 41 years. In 36 years as a trainer over 130,000 bankers (and many examiners) have participated in Jack's live seminars and webinars. Jack's career began in 1976 as a federal bank examiner. He later headed the product and education divisions of a regional consulting company. There he developed loan and deposit form systems and software. He also developed and presented training programs to bankers in 43 states. Jack has been an instructor at compliance schools presented by a number of state bankers associations. As a contractor he developed and delivered compliance training for the FDIC for ten years. He is a Certified Regulatory Compliance Manager and a member of the National Speakers Association. Kelly M. Owsley is Director of Training Services for Compliance Resource, LLC. Kelly's career in banking began in 2000. Since then she has worked for financial institutions ranging in asset size from $250 million to $3 billion. Kelly has worked in numerous areas of the financial services industry including retail branch management, lending, product development and training. In addition, Kelly spent three years in a training and development role with CUNA Mutual Group servicing the largest credit union in the United States. Most recently, she served as the Vice President of Compliance, BSA Officer, and CRA Officer for a community bank where she was responsible for implementing and training all compliance related topics. Kelly has conducted seminars in multiple states and has participated in numerous webinars sponsored by national providers. She is a Certified Regulatory Compliance Manager. Don Blaine is the Senior Training Consultant for Compliance Resource, LLC, a source of compliance assistance for financial institutions. Don has over 30 years of experience in regulatory compliance for the banking industry with banks ranging in size from community banks to money center banks. He is considered a subject matter expert in many of the consumer affairs laws and regulations and will be primarily specializing in training activities that will encompass the Bank Secrecy Act/Anti-Money Laundering laws and regulations as well as many of the laws and regulations related to deposit compliance. His prior roles have included: Chief Compliance Officer, Senior Compliance Regulatory Examiner, Compliance Audit Manager, and business unit compliance manager. He has taught at the ABA's National Compliance School and has also served as an instructor on BSA and compliance topics at various programs offered by state banking associations. Prior to joining Compliance Resource, LLC, Don served as a consultant to numerous banks in areas ranging from BSA to lending and deposit compliance. He has attained Certified Regulatory Compliance Manager (CRCM) and Certified Risk Professional (CRP) certifications.